"This very refreshing salad also works well as an addition to traditional tacos and quesadillas." In a large bowl, combine the black beans, garbanzo beans, corn, onion, jalapenos, red bell pepper, cilantro, tomato, olive oil, lime juice, honey, pepper and salt. Mix well and allow to sit 1 hour before serving. A little too sweet for us. 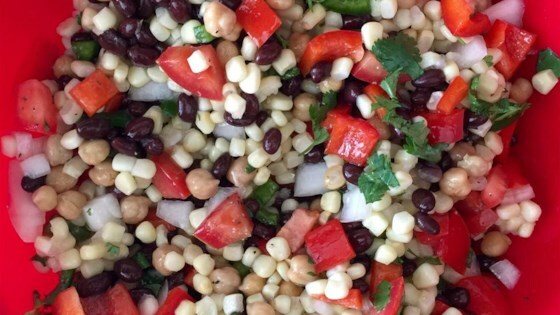 We prefer the flavors in Black Bean and Corn Salad II. really yummy! I made this as a side for a chicken breast cooked in lime and butter, and then served with warm tortillas. This is a nice variation on salsa and chips. Mix it vigorously to slightly mash the beans and make the dip stick together better. I'm looking forward to serving this during the summer. This salad is sooooo good. Its hard to believe it is sooooo healthy too.